The period piece “A Royal Affair” by Nikolaj Arcel (“En kongelig affaere” in Danish) appeared about the same time as “Anna Karenina” and "Lincoln") and was at first overshadowed by the more obvious offerings. But now “A Royal Affair” has an Oscar nomination for best foreign language film, and comes out as more compelling than (at least) "Anna". Magnolia Pictures is to be praised for picking it up (from Zentropa) for US distribution. The film, while depicting little known Danish history, gives us a major perspective on the Enlightenment and the spread of progressive thinking (as with Rousseau) in Europe. In the 1760s, Caroline Mathilde (Alicia Vikander) sails from England to Copenhagen to satisfy and arranged marriage with Christian VII (Mikkel Boe Folsgaard). As soon as she meets him, outdoors, peeking behind a tree, she sees that he is a bit of a fool. He grunts and speaks staccato. There’s an important hint just before she meets him. She asks when her books will arrive and is told that her books will undergo Danish censorship and some will get shipped back to England. “We’ll find something else for you to read.” It’s interesting how the royal courts feared new ideas even in print. Fulfilling royal duties in the Queen’s chamber is a bit of a challenge for them both, but somehow a male baby does result. That’s what marriage meant in those days. Enter the third vertex on a potential love triangle, the physician from Germany Johann Fredierick Struensee (Mads Mikkelsen), supposedly to attend to the unpredictable Christian, who is still seen as a buffoon and a bit mad. Caroline is swept off her feet by this older, wiser strong man (probably about 40). The illicit affair, leading to the tragedy at the end of the film, is inevitable. And there will be illegitimate babies. Struensee has also had published some progressive writings regarding social reform – but anonymously. In those days, you kept a low profile if you had “ideas”. But it is the relationship between Struensee and Christian that completes the triangle. At times, there are hints of bisexuality, making some of the film a bit like a soap opera (one thinks of “Will and Sonny” on “Days of our Lives”, or maybe “Nolan and Marco” on “Revenge”). Christian looks up to the older man and takes hints from the doctor on progressive reforms, including cleaner streets, orphanages, and smallpox vaccinations for all. Christian starts to become more likeable himself, and actually can sometimes fight off his own Court, able to fire people. As boyish as he looks, there’s a bath scene where – yes – he actually has chest hair (sorry, Johann doesn’t get into the bath with him, but almost). The Court is constantly reminding Christian that it has no money. So Christian orders that pensions for the Court be “means tested” to pay for some of his reforms. (Sounds like today’s debate on Social Security, Medicare, and the debt ceiling?) Christian gradually turns over power to the doctor. But when soldiers in the guard don’t get paid on time (again, the debt ceiling) a major revolt starts, leading to the tragic but necessary end. Christian’s biological son would return and become a good, progressive king. The official site from Magnolia is here. Caroline, by the way, plays the harpsichord or clavier (black and white keys reversed), old music that sounds like Scarlatti. The film was shot in the Czech Republic, and has some scenes with hills and low mountains that may not match the geography of coastal, low-lying Denmark. 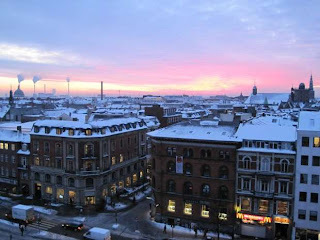 Here is the Wikipedia attribution link for Copenhagen picture. I visited the city in July 1972 and got drunk for the first time in my life at the amusement park on some very strong beer. Somehow this picture reminds me of "Smilla's Sense of Snow" (1997).